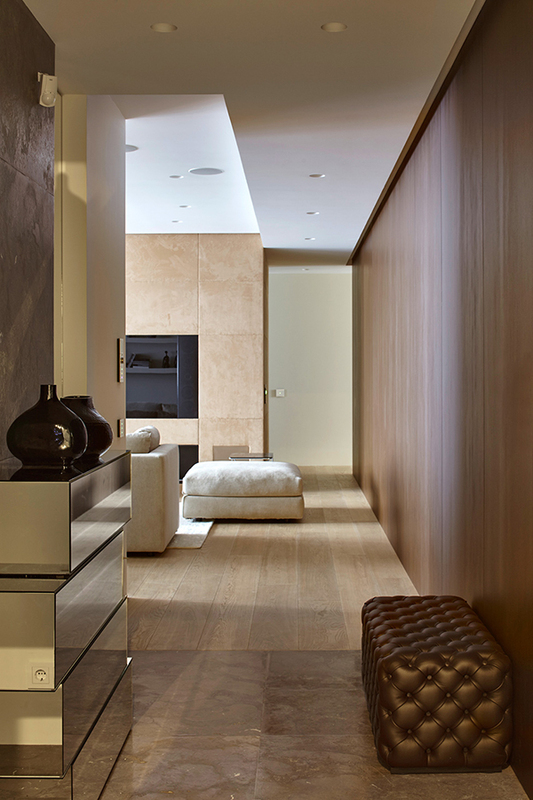 We have shown you days ago the interior of an apartment with a modern design featuring design and art. 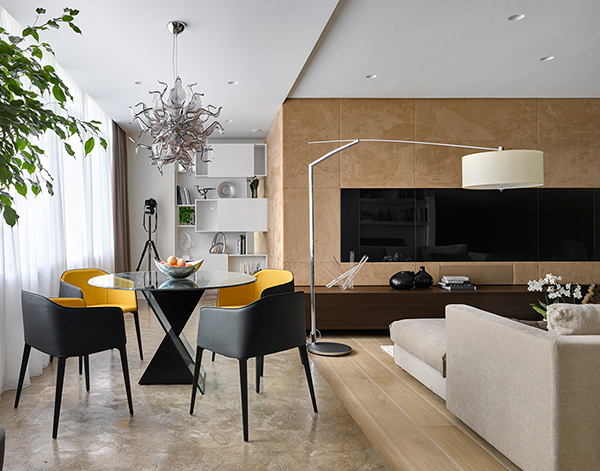 That was quite a merger but today, we will show you another inspiring apartment design that is perfect for modern living. The design is sophisticated and inviting which is the dream of every homeowner. And you will know what I mean once you see the apartment’s interior below. The walls of the apartment has wooden panels and suede. I love how it looks as it bring in a different level of sophistication. See that fire? Isn’t it an amazing feature of this apartment? 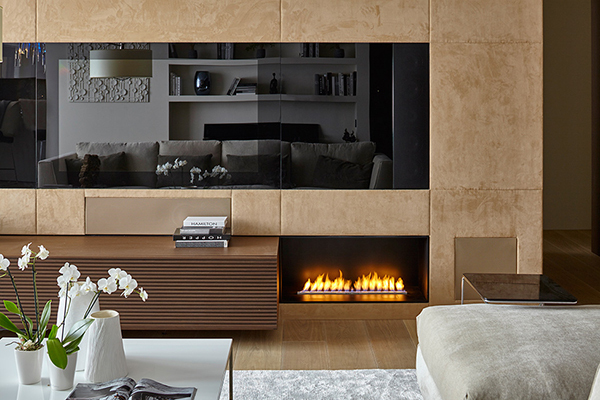 It doesn’t just add warmth but as well as the beauty of nature too right into the home. 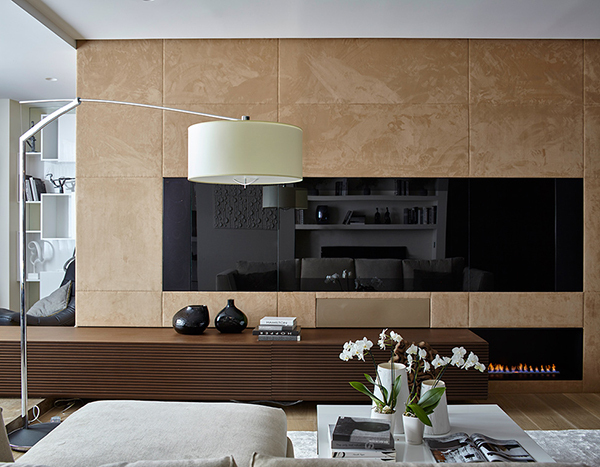 The suede wall panels are really stunning. I thought this only works well as a headboard but it does look even better in the living room! Every corner of the apartment was used cleverly just like the wall shelves on one side. 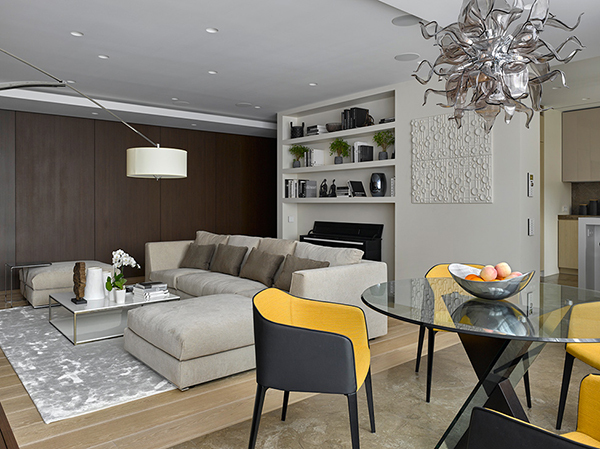 The designer did a good job in choosing the furniture too from the living room to the dining area. The dining area is just placed next to the living area for easier access but the space is well defined. 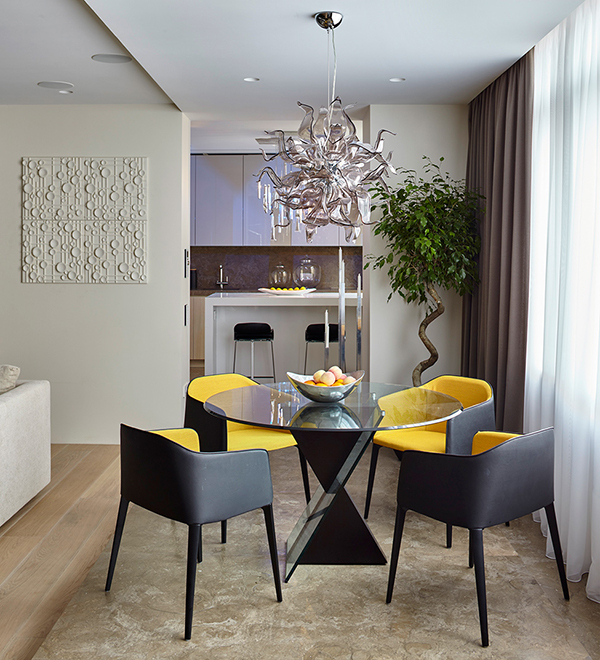 The chairs have bright yellow upholstery which adds a burst of color into the space. I like the design of the wall shelves as well as the idea of adding a lounge chair into it. This is the hallway of the apartment where you can see a pretty tufted golden bench and mirrored cabinet. 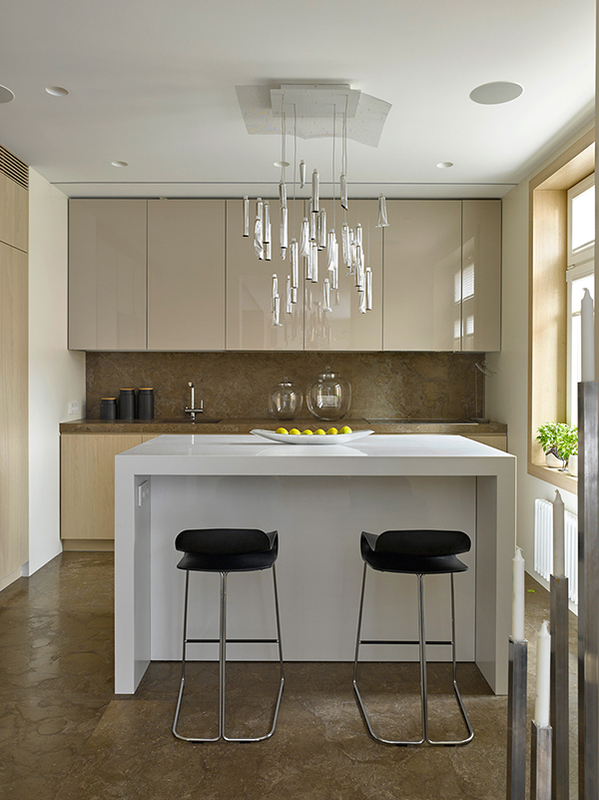 The kitchen is small yet functional with a white island and two high counter stools. Now look at this bedroom! It feels like you are sleeping outdoors while in it because of the plants and stones! 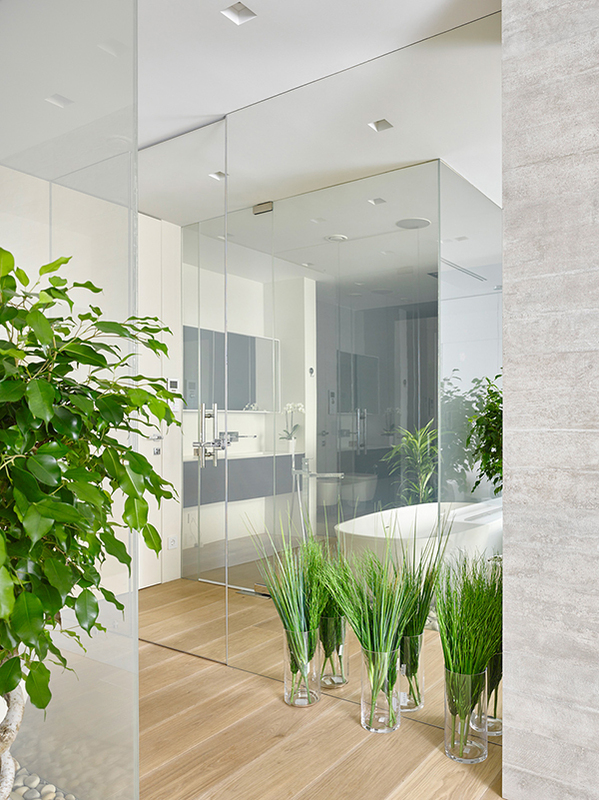 This bedroom sure had a huge dose of nature in it. I love the entire look! And one feature in the bedroom that is totally amazing is the fireplace. 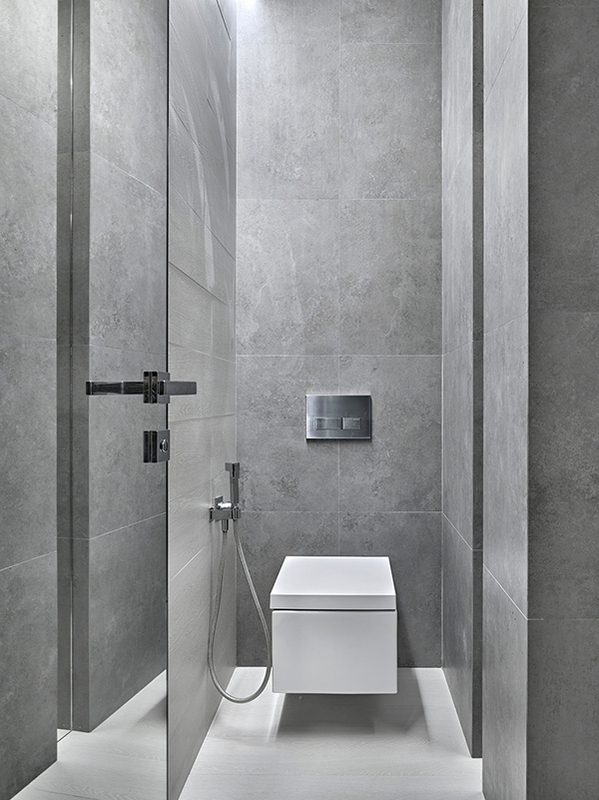 The bathroom is spacious which is enough for everything the owner wants to make them feel comfortable and relaxed. 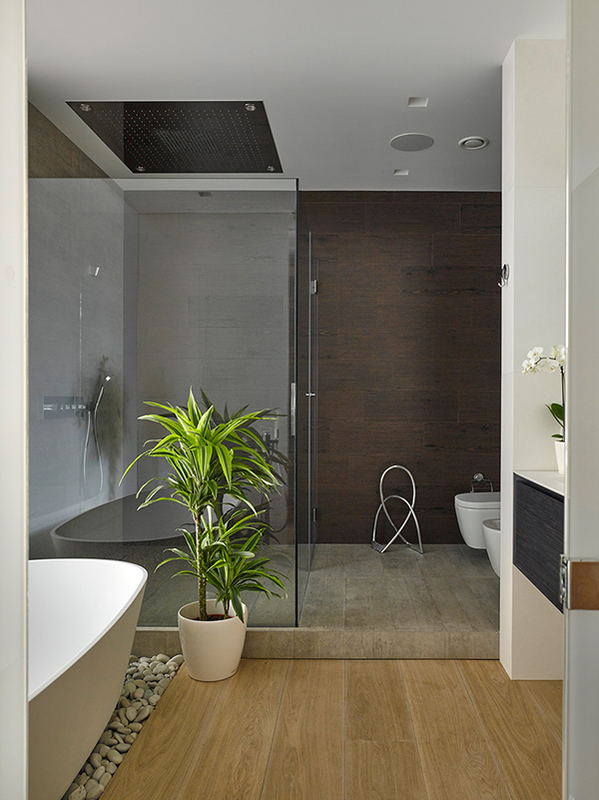 The bath tub sits on stones while the rest of the space has wooden flooring. 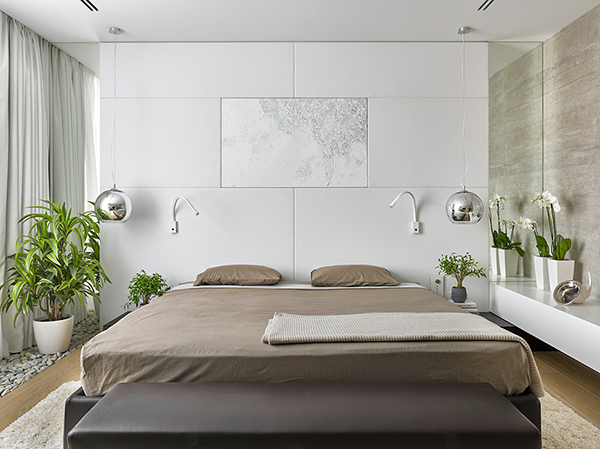 And like the bedroom, it has plants in it too giving it that outdoor feel. There is also a beautiful landscaping around the house with a modern design and feel. For the toilet area, this is how modern and simple the design is. Lovely, right? The interior combined white, light brown and beige tones wrapping up into a luxurious apartment that is very cozy and comfy to live in. 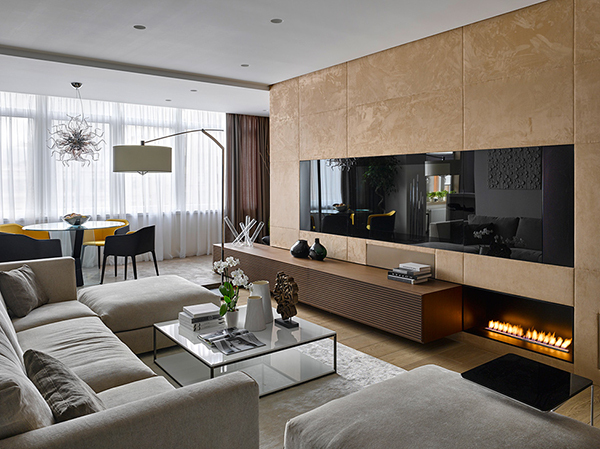 The family commissioned Alexandra Fedorova – fedorova.ru, to design their space and for sure, they will not regret picking her because their home turned out to be very gorgeous! Which space in this apartment do you love most?